Hey, kids. Happy Friday.....ish. It's 9 p.m. on Friday night and I'm just now getting to my 'fessions. Part of that is Blogger's fault (they were down for almost 24 hours) and part of that is because I just now got my kids to bed and I feel like I worked a 14-hour shift at a daycare. A daycare where children climb fences barefoot and get splinters in every toe, where children are covered in mysterious rashes you have to treat twice a day with a zillion little bandaids, where children argue with every single thing you say whether they have listened to your whole sentence or not, and where the kids leave the gate open and let the entire daycare loose in the neighborhood and you find the teeny ones halfway down the block. I've had a day. I'm still in my sweatpants, I haven't showered, my house is a disaster and my husband just informed me it smells like alcohol in here. I wish I could say that was because I just drank a big martini, because I certainly need one, but I have no idea what he's smelling. Maybe it's the smell of my brain cells dying from overstimulation. Anyhoo~ it's okay! They are finally in bed, tomorrow is Saturday, my husband has the day off (YIPEEEEE!) and we have many festivities planned. Some sort of gluten-filled breakfast that does not include blended lettuce, yoga for me, a ceremony at the library because my son was one of the winners in their writing contest (I am so proud), a little league game, and Jarrod is going to build me some new garden boxes so I can grow.... things. I'm pretty sure the "real" gardeners had their ducks in a row months ago, but we're more the "fly by the seat of your pants" kind of gardeners. If I get a zucchini and some herbs I'll be happy. That can't be too hard right? Aren't zucchinis like cockroaches? They just sort of multiply and refuse to die? See, I'm going to be a great gardener. Alrighty, let's get to this shall we? Based on my "Notebook for Grandma" post, you guys probably thought I had something special and meaningful planned for Mother's Day. You would be wrong. I gave my mom a garlic press. In my defense, she did cry tears of garlic-pressing joy when she opened it. Last Saturday while Jarrod was working I got myself a babysitter so I could have a few blissful hours to myself. Unfortunately, I forgot to go by the bank to get cash while I was out. It all worked out, though...I paid the babysitter $5 in dimes. I told one of my kids that his whining felt like sandpaper on my eardrums. Harsh, but true. When younger moms ask my advice, I feel like a big 'ole fraud. Don't they know I'm totally winging it here, and seldom successfully? Greyson gave me a big hug this morning and said "Thanks for not yelling at me or losing your temper today, Mom" *ouch* I am a serious work in progress. This is why people love to be grandmas... it takes like 30 years to figure this stuff out and you need a do-over. Speaking of do-overs, I'm supremely grateful that God gives us a big fat one called "baby teeth." Who knew, you actually have to brush those things FOR them because three-year-olds are not very thorough? I'm looking forward to them falling out in a few years so we can try again. I haven't been to the doctor for illness in my entire adult life, but ever since I hit 30 I am suddenly a hypochondriac. The more I google, the more convinced I am that I am falling apart at the seams and may or may not have deformed feet. I gotta stop googling, ignorance is bliss. You know those expensive whitening strips I bought from the dentist? I've used them once. My problem is that you need 30 uninterrupted minutes for them to work. I don't seem to be capable of committing to not put anything in my mouth for 30 minutes. You never know when the serious munchies might strike, and heaven forbid I'm whitening when it does. I was halfway to the video store, planning to return a movie, when it suddenly dawned on me that I had set the movie on the roof of my car and couldn't remember grabbing it before I got in. I pulled over and sure enough, there was no movie in my car or on my roof. I then proceeded to backtrack all the way home, scanning the road for the movie that undoubtedly flew off at some point. I had just started rehearsing the speech I was going to give the video store clerk, when I turned a corner in my neighborhood and there was the movie in the middle of the road! It hadn't even been run over. The case got pretty banged up when it flew into the pavement, but the movie was fine. Hurray, I will not have to find a new video store afterall! Thanks so much for your patience, my fellow 'fessers! If you wrote a 'Fess Up post and want to link up with me, I would be honored. 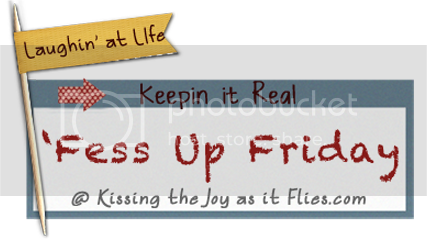 And for those of you who haven't done so already, click through some of the hilarious 'Fess Up Friday posts linked up on previous Fridays. They are awesome! I love that you aren't going to try to grow lettuce to fuel your morning smoothies... that would be way to practical. As far as the baby teeth go, I HATE brushing my kids teeth, so does my husband. It's like who pulls the shortest straw when it comes that time of night. I try to see it as a blessing that I get this quality "face time" with my fellas, but I truly find it annoying. AND by the way, my oldest is so proud of his silver teeth, why should I deprive him of such a wonderful thing? I am 'a work in progress' too, my friend. That same statement you heard could just as easily come my way one day. That photo of the laundry made me crack up, because that right there is the reason my mom threw up her hands and said, "I'm not doing it anymore!" when I was 13, and that's when I learned to do my own laundry.